1. In front or behind you? 2. How do you know if you have passed a waypoint? 3. Turn left or right to reach a waypoint? 5. Are two line segments intersecting? 6. Are two triangles intersecting? 7. Are two rectangles intersecting? A Constrained Delaunay triangulation is a triangulation where we know that some edges exist in the triangulation. This can be useful if you for example want to make a hole in the mesh or make a navigation mesh for your game. We have earlier learned about the Delaunay Triangulation algorithm, and we will here learn how to improve it by making sure some edges exist in that triangulation. So make sure you have the code from that tutorial. Step 1. 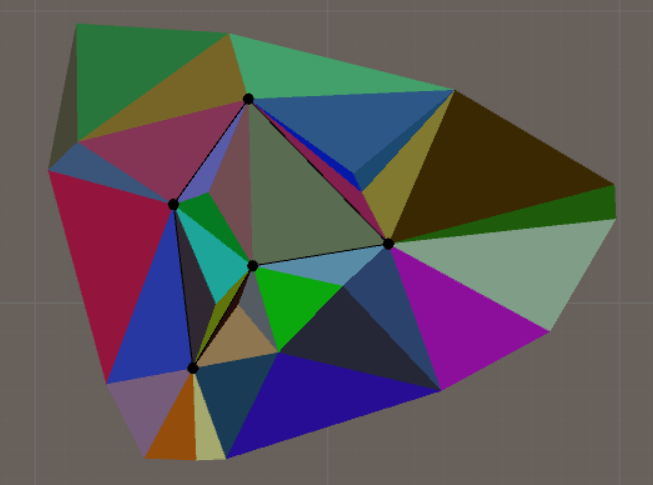 Add the vertices that belongs to the constraints to the vertices we have and create a Delaunay triangulation. The vertices we already have in the image below are completely random, and the constraints are sorted clockwise, which will be useful later on. Step 2. 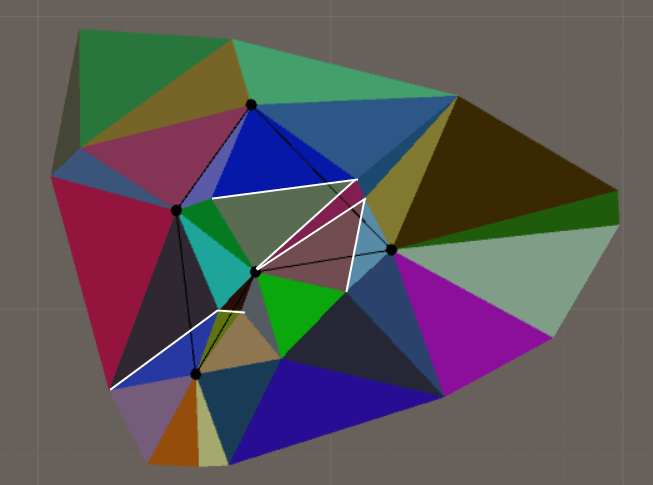 For each constrained edge, find if this constraint already exists in the triangulation. 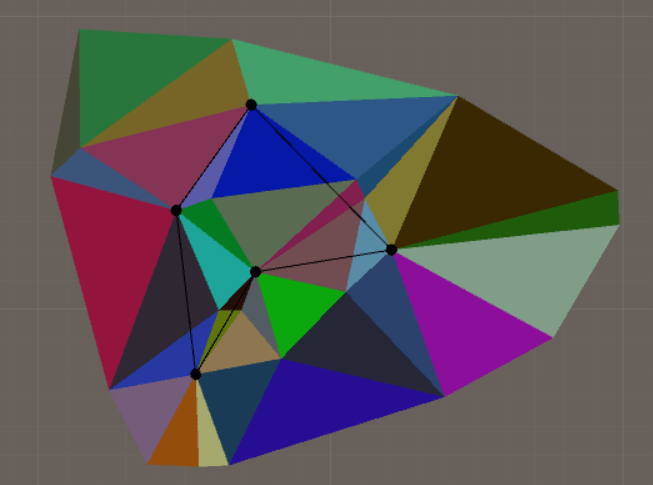 Sometimes we are lucky, and the Delaunay triangulation is by accident making a Constrained Delaunay triangulation. But if this is not the case, then we have to find the edges that intersects with each constraint. As you can see in the image below, we were lucky with one edge that already matches the constraints, so we don't need to improve it. But we have to remove the other intersecting edges. Step 3. To remove the intersecting edges, we will test all possible triangle arrangements and will always find a triangulation which includes the constrained edge. 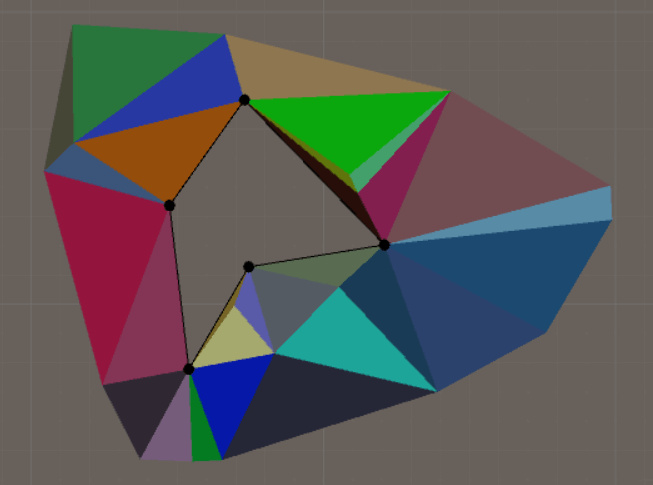 When we have removed the intersecting edges, we will try to flip the new edges and see if we can improve the triangulation and make it more like the original Delaunay triangulation. This repair process is similar to the process in the original Delaunay triangulation algorithm. Step 4. Remove unwanted triangles. This step is optional, but if you want to make a hole within the constraints, then you have to remove some triangles. This assumes the points in the constraints are ordered clockwise so we can tell if a triangle is inside or outside. ...and all of this can be accomplished in just 700 lines of code (+ the code for the original Delaunay triangulation). To make the code work, you might need some algorithms from the "Useful algorithms" and "Are two line segments intersecting?" sections. And you might also need an extension method that easily converts a vector3 to a vector2 by removing the y value, which is what happens if you see .XZ(). //Is any of these edges a constraint? //Is an edge between p1 and p2 a constraint? //Is the edge that doesn't include p1 intersecting with the constrained edge? //Is this edge intersecting with the constraint? //Is an edge crossing another edge? //Is an edge (between p1 and p2) a part of an edge in the triangulation? The author of the report added a few optimizations to make the algorithm faster. For example, the report suggested that you should "rotate" triangle (in the same way as when we found intersections with the constraints) to find if a constraint already exists in the triangulation. But 700 lines of code is enough and it will make the tutorial more and more complicated, so I've ignored that optimization. If you think this algortihm is too slow, you can add it.